While your cat might be fluffy, sweet and loveable at its core, your furry feline pal is still a carnivore. As carnivores, cats are attracted to and crave protein – specifically the protein found in meat. Many dry cat food products are created from protein sources, such as chicken or fish. However, your cat’s nutritional needs may not be completely met by these dry pet foods. Most veterinarians will recommend that you add a nutritional supplement, such as NuVet Plus, to your cat’s diet. The addition of a high quality supplement will ensure your furry friend receives the necessary amount of protein in their daily diet. 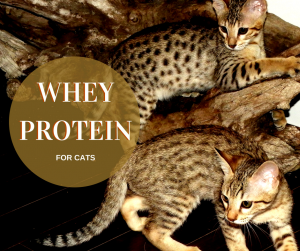 When choosing a feline supplement, one of the most important ingredients to look for is whey protein. Whey is one of the two proteins found in milk. Whey protein is found in milk during the process of making cheese. It separates from the casein protein found in milk as a by-product of the cheese making process and is considered a complete protein. • Whey protein is one of the most important protein sources for animals that are carnivores. Just like how many people use this protein for muscle production, cats need it for the same purpose. It helps to build new muscle mass as well as maintain the muscle mass that exists already. By building muscles and keeping muscles healthy, your furry friend will have an improved quality of life. • Whey protein will also help keep your cat’s metabolic rate in check, ensuring that it consumes, processes and uses all of its nutrients in the best way possible. This protein is a highly-digestible and complete protein containing 20 amino acids including methionine, lysine, and taurine. Cats are unable to produce the amino acid taurine, which is important in promoting a healthy immune system and supporting other body functions. • Research has found that whey protein has as many health benefits for cats as it does for people. Whey protein is low in lactose content. Therefore, it is safe and healthy to give to cats in the form of a supplement. • Cats that have a protein deficiency can experience various health issues. Essential nutrients, like whey protein, can help to ensure that your cat gets all of the protein it needs in order to support a healthy immune system. The amino acids in the whey protein promote humoral immunity. Whey protein is a key ingredient found in the feline formula of NuVet Plus. NuVet Labs has worked for 8 years to develop a formula that specifically benefits cats. Many companies simply produce a pet supplement product designed for all domesticated animals, but the NuVet Plus feline formula is truly made for that special cat in your life. It is composed of natural antioxidants, amino acids, vitamins, minerals, herbs and more to provide a complete nutritional supplement that helps to boost the immune system and defend your feline companion against free radicals. For more information on whey protein and the NuVet Plus feline formula, visit the NuVet Labs product page today.